A couple of weeks ago I met the lovely REN team, who truly opened my eyes in terms of skincare and generally looking after yourself. After a through talking to (comparing my skin care regime to their own really was a tad embarrassing, even after the effort I've been making recently) they kindly gave me a few of their products to try - and as they are so damn good I thought I'd share them with you. First up, don't panic if you're a lazy girl like me. The above may look like a lot of different things (read: effort) but when you see the results for yourself - and how quickly you can achieve them in - you'll start to understand why I'm happily setting my alarm 5 minutes earlier to make time for them. For a start the V-Sense day cream has already (after 6 days) toned down the fine lines I have around my eyes and the skin around the same area feels less puffy and tighter - which is the one thing I feel really self conscious of so am delighted. The hot cloth cleanser was something I went a bit "Oh god, looks complex" about, but I timed it and it took me 7 mins to do. When I say it cleans your skin it, I mean you'll want to smack yourself for letting it get that dirty in the first place - even when your skin looked fine in the first place. My face felt like it had been to a day spa. Amazing, and for £16 it's a damn sight cheaper than a facial. I then followed it up with shower with the Moroccan Body Wash with smelt super yummy and one of few that hasn't dried my skin out afterwards. Last but by absolutely no means least is the Radiance Renewal Mask, which was another I half rolled my eyes at when I saw. I did this on Sunday (5 days ago) and my skin still feels as good as it did when I took it off. It got rid of all the blocked pores and general nastiness we tend to use concealer for. It's a bit of a "rejuvenator" and really good for people who come back from holidays - ski or sun - and I can totally see why. Perhaps its the combo of all 3 products, but to be honest this is one routine I am 100% keeping up. I really need to invest in some REN! I'm totally lazy too - the one thing I find difficult is to incorporate new products into my routine! The hot cloth cleanser looks lovely though - will give it a try! I didn't know ren but i will order to try!!! A good skincare routine is soo important and Ren products are great. I've always looked after my skin and regularly get complimented on how young I look. Haven't tried their hot cloth cleanser but want to now. 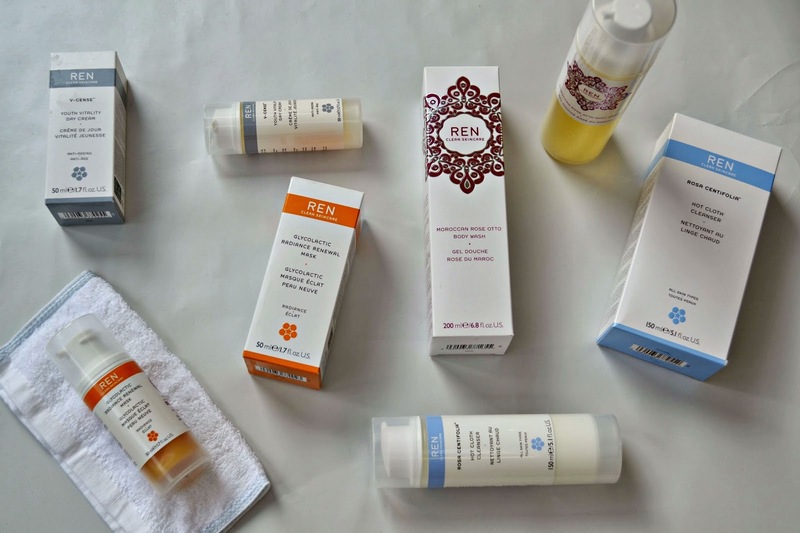 I love the Ren products - I remember when they first opened a little store at Liverpool Street, I lived in Hackney at the time and worked close by and it was such a nice little store to browse. Their Rose scented products are to die for! I'm such a massive fan of REN! The Radiance Renewal Mask and Morrocan Rose Otto Body Wash are two of my favourite products ever ever ever.